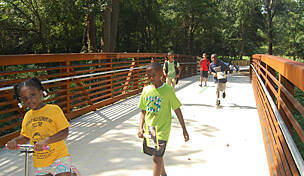 The Atlanta BeltLine will link more than 40 neighborhoods, multiple public parks, and mass transit stations in a planned 33-mile trail network throughout the city. Rather than the straight line of a typical rail-trail, the growing BeltLine will form a 22-mile loop around the city, with another 11 miles of spur trail that tie in to neighborhoods and parks. While not precisely a circle—it was once dubbed the "green ghost" for its shape—the rail-trail at the core of the project comprises four different inactive freight lines. 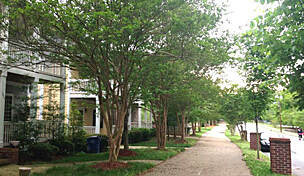 West End Trail: This first section of the Atlanta BeltLine opened in 2008. It now stretches 2.3 miles. 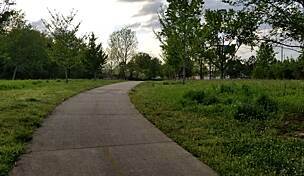 Northside Trail: This 1.1-mile segment opened in 2010. Eastside Trail: This segment expanded in 2017 and now stretches 3.1 miles. 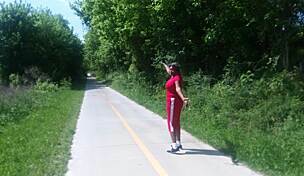 Southwest Connector Trail: This 1.1-mile segment opened in 2013. Westside Trail: This 3.3-mile segment opened in 2017. 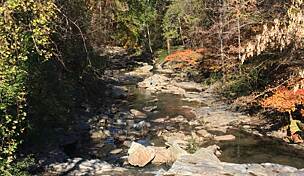 In 2014, the first phase of the Atlanta Streetcar opened downtown, just five blocks from the Eastside Trail. Future expansion is planned to connect the streetcar with the BeltLine. 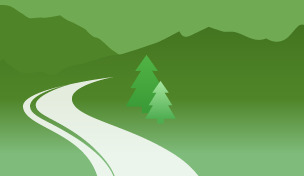 The trail and active rail line will form a parallel loop around the city in what is known as a rail-with-trail. 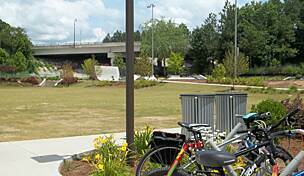 To provide people with a peek at the trail's progress, a number of BeltLine tours are offered. 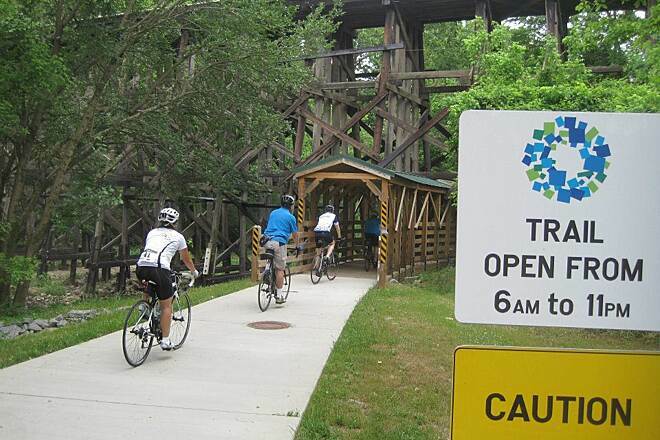 The Atlanta BeltLine Partnership offers free, narrated bus tours of the developing trail on Friday and Saturday mornings, the Atlanta Bicycle Coalition leads guided bicycle tours on the weekends, and Trees Atlanta offers seasonal guided walking tours of the trees and plants along the route. 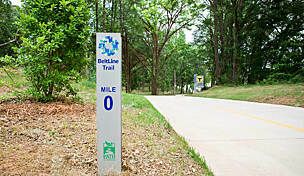 As the Atlanta BeltLine connects several parks throughout the city, parking can be found in and around these parks, such as Piedmont Park (400 Park Drive NE) for the Eastside Trail, Rose Circle Park (982 Rose Circle SW) for the West End Trail, and Tanyard Creek Park (460 Collier Road NW) for the Northside Trail. toured, walked, and biked it several times, finish it please! first i took the van tours to help community visualize the trail. after all its a 22-mile ring around downtown and i hadnt visited some parts of town in a while. 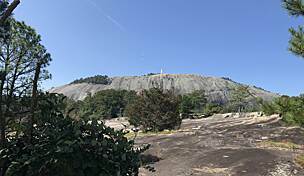 then i came back for more van tours and dragged my family along, we all grew up in ATL. then i biked it with ABC who leads tours annually in May. 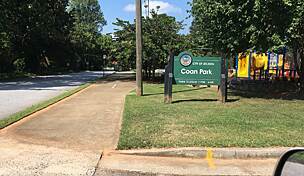 then they opened some parks, O4W, skate park and i came for the lantern parade in the fall. 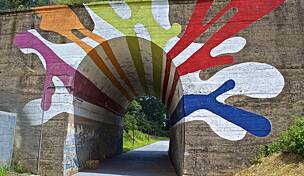 then they held art on the beltline to engage users and we walked parts we wouldnt have dreamed of. and now a 3-mile stretch called the eastside trail is open and we've biked it, walked it, and loooooove it. we now incorporate a coffee, cafes, market stops on our bike ride.